An early morning arrival at Leh airport, you will be greeted by your guide and transferred directly to your hotel. 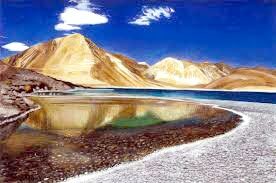 After check-in, spend the day taking rest and adapting to the high altitude of Ladakh. In the late afternoon visit the beautiful Shanti stupa and capture some magnificent photos at sunset. Overnight stay inLeh hotel. Start your morning with a picturesque drive to Shey Village and a visit to Shey Monastery and Palace (both built in 1655 as summer retreat spaces for the reigning King). Proceed to Stok Palace museum to learn about the royal kingdoms of Ladakh and have a chance to view many royal artefacts and paraphernalia dating back to the 11th century. Have lunch in the lama run restaurant in beautiful Thicksey monastery, then take an overland safari drive to Hemis Gompa before returning to Leh for your overnight stay. This morning you will take another scenic drive to the magnificent Pangong Lake - a must see destination for your time in Ladakh and made famous by the 'Three Idiots' movie. 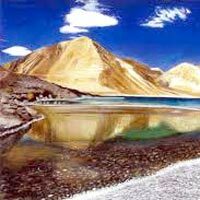 More than half of Pangong Lake separates Ladakh from China, and the appearance of the water changes color at every angle of the sun. This experience makes for some amazing photographs so don’t forget your camera! Return to Leh in the afternoon in time for souvenir shopping in the local bazaar. Overnight stay in Leh hotel. An early morning departure for ‘Nubra Valley’ - popularly known as the ‘valley of flowers’. Situated in the northern part of Ladakh(between the Karakoram and Ladakh Himalayan ranges), the journey between Leh and Nubra takes you over ‘Khardong-la-pass’ - the world's highest motor-able road located 18390 feet above sea level! A half day drive of breathtaking landscapes and spectacular scenery,this experience is sure to be once-in-a-lifetime and truly unforgettable! On arrival in the Valley, you will visit the Disket monastery to see the 100ft tall Buddha statue before settling in to your overnight stay in a luxury camp. In the morning you will visit Samstanling monastery in Sumoor before climbing aboard Sumoors resident double-humped camels and exploring the sand dunes with a camel safari! On completion, return to Lehfor a half day of city sightseeing including visiting the ancient Leh palace and Tso Mo Gompa. Overnight stay in Leh Hotel. You will begin the day with a visit to Alchi monastery to see the Kashmiri influenced architecture of the local area. You will take a road trip stop at the mysterious Magnetic Hill to watch reverse gravity in action and then proceed to the Sikh temple of Pathar Sahib. Stop for some magic photos at the intersection of the Zangskar and Indus river at Sangham before returning back to Lehin time to browse the markets before your overnight stay in the hotel. An early departure for your overnight stay in Tsomoriri- located 14,000 ft. above sea level. The local area (known as ‘Changthang’) is a land of wilderness and magnificent landscapes and the lake itself is a breeding ground for numerous species of birds. Throughout your journey, you may be lucky enough to interact with the nomadic Changpa people who can often be seen moving from one place to another - grazing herds of goats, sheep and yaks to produce sellable materials such as ropes, clothes and shoes. Overnight stay in Tso moriri in luxury camp. In the morning you will visit Korzok village with its houses and its Gompa appearing like a mirage. The few barley fields at Korzok are among the highest cultivation in the world. One last chance for bird-watching, taking photos of the ever changing colors of the lake or just enjoying a few moments of peace and quiet before proceeding on to Leh for any last minute shopping or sightseeing. An early morning flight back to Delhi.